The 5th USB Power loading device. 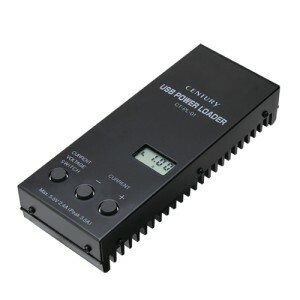 The USB Power Loader has the ability to selectively adjust the current load applied to target devices to be measured. The load can be increased from 0.1A up to 2.4A by increments of 0.1A. Output voltage is measured at the time the current load is applied. Use the USB Power Loader to check the amount of current supplied by USB ports on PCs, USB chargers, USB-AC adapters, and other USB compliant devices. the voltage drop of USB cables. how quickly a battery will discharge when a specific amount of load is applied. if specific product features of USB devices such as voltage and temperature monitoring are operating as expected. # In the event that 2.5A is exceed, the device will provide a limited window of operating time before temperature sensors will automatically shut the device off. Target devices should support both Type A USB connectors and 5 volt power output. Most USB ports in PCs, USB chargers, and USB-AC adaptors, conform to these specifications but be sure to verify before use.